Shhh, be very quiet. Your chicken is sleeping! 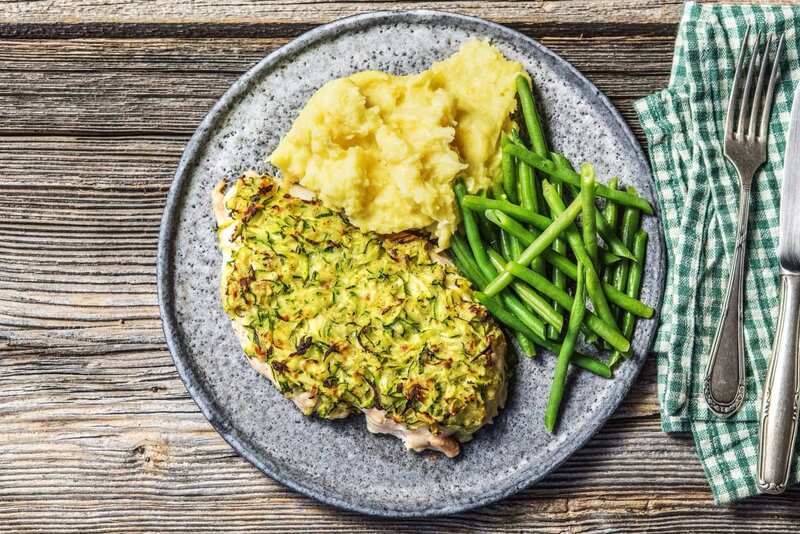 The layer of zucchini that tops these chicken breasts is like a blanket that keeps the meat warm and cozy while it gets its beauty rest. 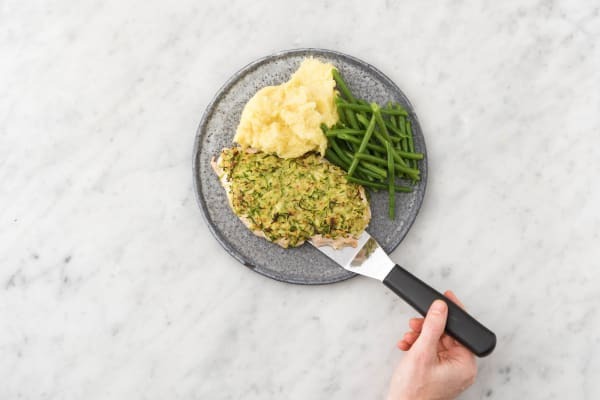 It not only brings some bonus greens to this recipe but also helps the chicken stay moist and tender. Feel free to treat the mashed potatoes on the side like a fluffy pillow to dream sweet, buttery mashed potato dreams on. Wash and dry all produce. Preheat oven to 400 degrees. Peel potatoes, then cut into ½-inch cubes. Grate zucchini on large holes of a grater. Place shreds in the center of a clean kitchen or large paper towel. 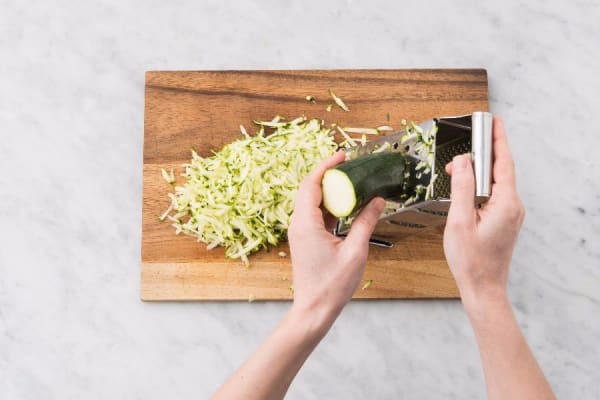 Gather towel corners and squeeze as much moisture as you can from zucchini into sink or bowl. Season generously with salt and pepper. Mix Parmesan and zucchini in a medium bowl and set aside. Place one chicken breast between two pieces of plastic wrap. 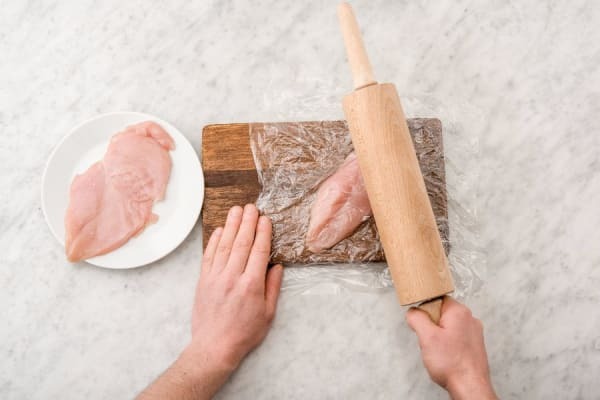 Pound with a mallet, rolling pin, or heavy pan until ½ inch thick. Season all over with salt and pepper. Repeat with other chicken breast. 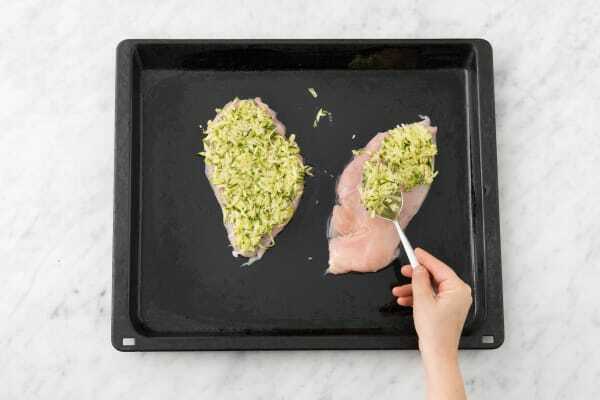 Place chicken breasts on a baking sheet and brush each with a drizzle of olive oil, then top with a thick layer of zucchini topping. Bake in oven until no longer pink in center, 12-15 minutes. Heat broiler to high or increase oven temperature to 500 degrees. Broil (or bake) until golden and crisp on top, about 2 minutes. While chicken bakes, place potatoes and a pinch of salt in a medium pot with enough water to cover by 2 inches. Bring to a boil and cook until easily pierced by a knife, 10-12 minutes overall. About 3 minutes before potatoes are done, add green beans to pot and cook— they should become tender at about the same time as the potatoes. 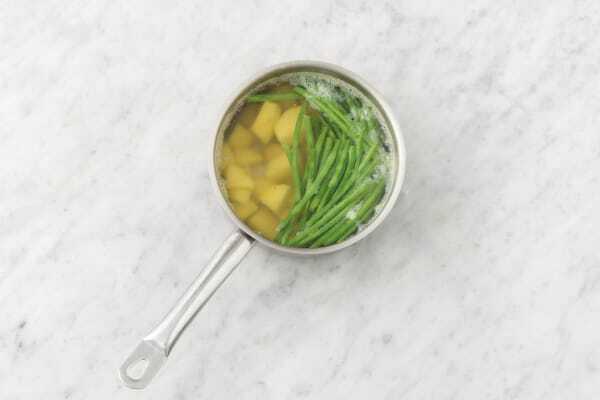 Remove green beans from pot with a slotted spoon. Drain potatoes and return to same pot along with 1 TBSP butter and 2 TBSP milk (we sent more). 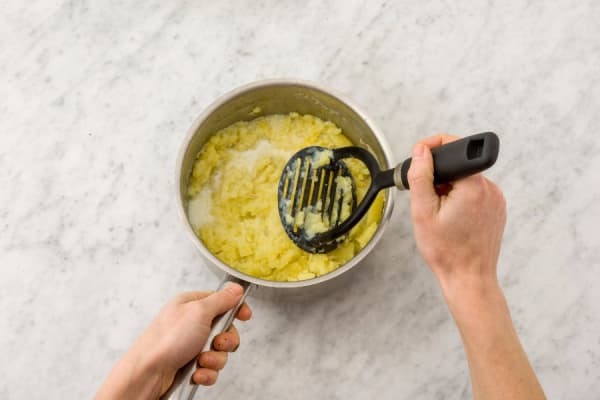 Mash with a potato masher or fork until very smooth, adding more milk as needed to achieve a creamy consistency. Season with salt and pepper. Cut lemon into wedges. Divide potatoes, chicken, and green beans between plates. Serve with lemon wedges on the side for squeezing over.